B: Download button. Saves the design to the local device. To remove it, go to Template Settings > General Tab > Allow Design Download and set it to NO. C: Button to change the product. To remove it, go to Settings > "Translation / Other" Tab > "Show an icon in the designer to change product" and set it to NO. 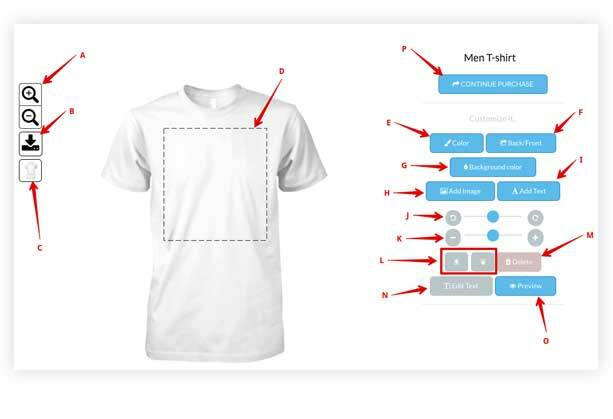 D: Customizable area of the product. Can be changed in the backend (Template Settings > Modify). E: Change the color / variation of the product. G: Change the background color of the customizable area of the product. H: Add clipart, upload image and Instagram. L: Buttons to move a layer forward / backward. Put a layer (image/text) over or below another layer. N: Edit Text layer. change color, line spacing, font, etc. of a text layer. O: Finish the design, save it and continue the checkout process. Notice: You can change all the text (buttons, popups, alerts, etc.) by using the translation tool.